But as Cantoni would remark early on in the much later conversation1 that is the foundation for this article, ’We don’t really know each other do we? I mean we have met several times, but we’ve never had an opportunity to sit and talk like this.’ He was of course correct. While I knew of and had seen their carpets, marvelling at their deft use of materials, construction, and quality, I didn’t really know the people. In the autumn of 2017 C.E. Lora and I had once shared a taxicab in Istanbul but aside from the conversation therein and passing conversations during trade shows, my knowledge and understanding of the people behind cc-tapis was minimal at best. Was… . 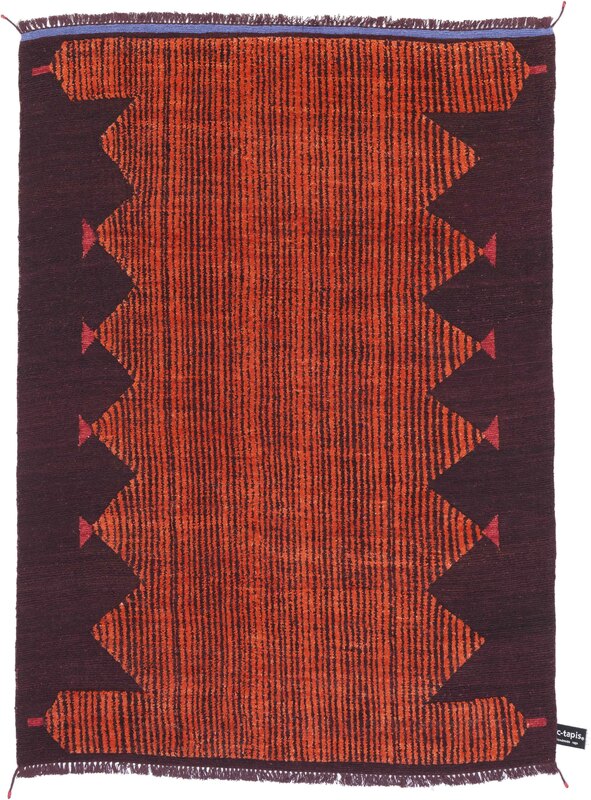 ‘Primitive Weave Rust 4’ by Chiara Andreatti for cc-tapis. | Image courtesy of cc-tapis. 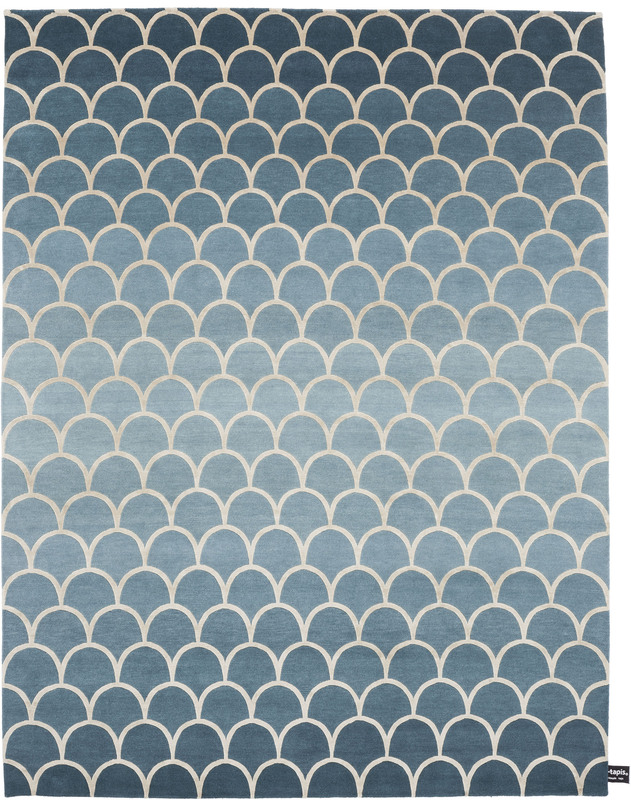 ‘Ecailles Degradé 2.0’ from the Contemporary Collection by cc-tapis. | Image courtesy of cc-tapis. So it was then when opportunity – in the form of a business trip to Northern Italy – presented itself, I contacted Cantoni to arrange an interview. Scheduling conflicts prevented Chamszadeh from joining the other two cc-tapis partners, but on a stunningly beautiful if not also very hot Milanese summer day, I found my way to the offices of cc-tapis to enjoy a coffee, or three, with Fabrizio Cantoni and Daniele Lora. Time and Date: 11:30, Saturday, 14 July 2018 C.E. The Ruggist (MC): I am so sorry I am late, I got a little turned around coming from the Metro at Duomo. Fabrizio Cantoni (FC): What do you mean? You are right on time. You said about 11:30 and here it is, just after. Cantoni, Managing Partner of cc-tapis, says this, as he does most things, in an exuberant and uninhibited manner. This is in stark contrast to his business parter, Daniele Lora, Artistic Director of cc-tapis, who favours observation, listening, and contemplation before interjecting a well formed, concise, almost profound, highly relevant statement in a voice subdued and well contrasted with that of Cantoni. It is immediately apparent the two complement each other well. 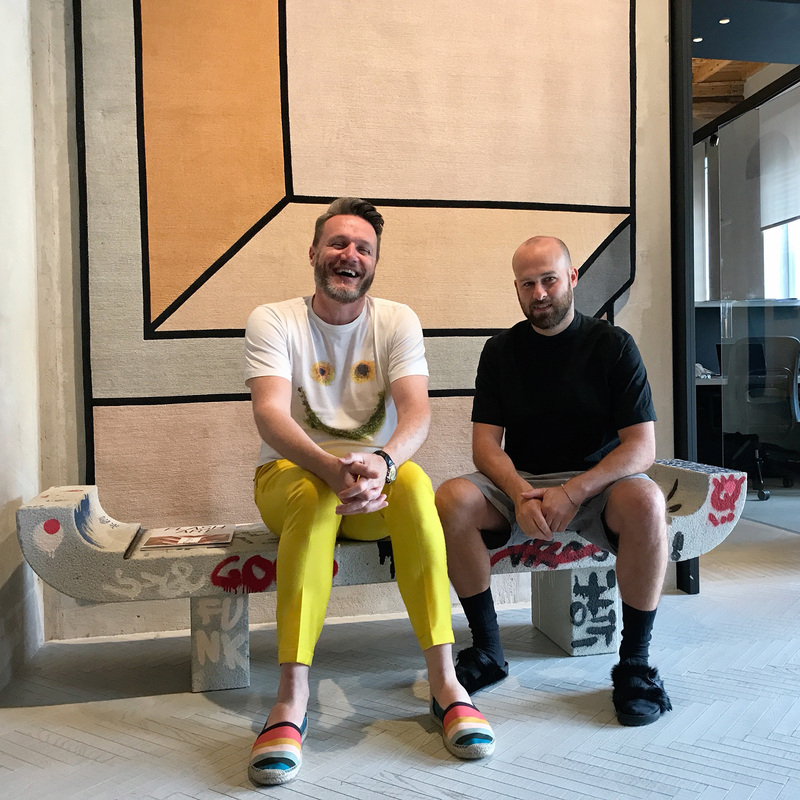 Fabrizio Cantoni (left), Managing Partner, cc-tapis; and Daniele Lora, Artistic Director, cc-tapis; shown on 14 July 2018 in the foyer of their firm’s offices at the Piazza Santo Stefano, Milan, Italy. | Photograph by The Ruggist. FC: Would you like a water and to freshen up before we sit and talk? MC: I would love a water and what do you mean? How can you tell I need to freshen up? I say that in that characteristic subtly sarcastic tone North American’s excel at using. Having arrived in Milan only thirty-five (35) minutes prior on the train from Lago del Garda where I had given a private client presentation of ‘For the Love of Carpets!‘ I found myself wholly unprepared for the oppressive heat of the Milanese summer. I had previously wondered if Cantoni’s own expressed desire to ‘conduct the interview early’ so that he may flee (my hyperbolic choice of word) the city heat was some form of exaggerated pining, yet now having experienced – if only briefly – the heat of a thousands suns and humidity one can safely describe as Amazonian I realize his desire is as well founded as those New Yorkers’ who flee their own city in August. And while it is I adore lazy summer afternoons on the beach at home in the Canadian Maritimes, this is not the beach, it feels about ten (10) degrees celsius warmer, and my sartorial assemble selected specifically to ‘look professional’ is soaked through with sweat from the Metro ride and brief walk from the Duomo. I accept the offer to take time to refresh before rejoining my colleagues. MC: Thank you so kindly. Sorry about that, oppressive heat and I simply do not get along. FC: So I know you mentioned we need to have coffee to drink during this interview and Daniele and I thought of taking you to the coffee shop just next door, but we can also just make coffee here. Perhaps that will be better to talk about us, here surrounded by everything that is cc-tapis. MC: I don’t mind staying here at all. Technically it violates the cardinal rule of ‘Over Coffee’ which is that I pay for the coffee, but if it means we can stay inside… …what is the harm? Cantoni and I take a seat at a large counter island in their main office space. It is an airy space with high ceilings, rows of desks adjacent to the windows, and an open concept kitchen where we find ourselves sitting and relaxing; the recently activated air conditioning soothing my faux heat exhaustion. Lora begins work on our espressos while the three of us enjoy some trivial small talk until the coffees are served. MC: So should we get started? I know you want to be able to get on your way today. FC: Yes of course. I do want to see my lovely wife Nelcya. It is a shame she was not able to join us today. You would have been in for a real treat [with the three of us]. MC: It’s lovely to be here with you nonetheless. 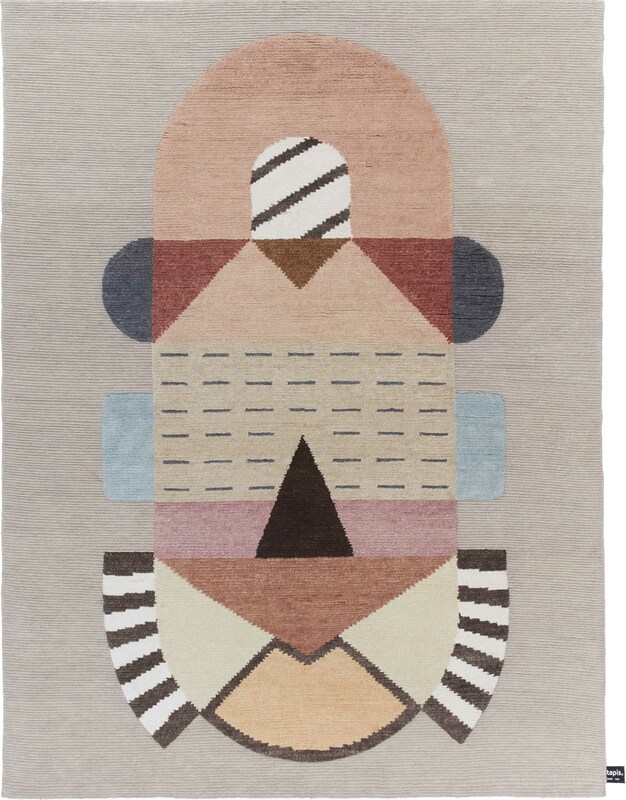 ‘Cartesio Standard’ by Elena Salmistraro for cc-tapis. | Image courtesy of cc-tapis. 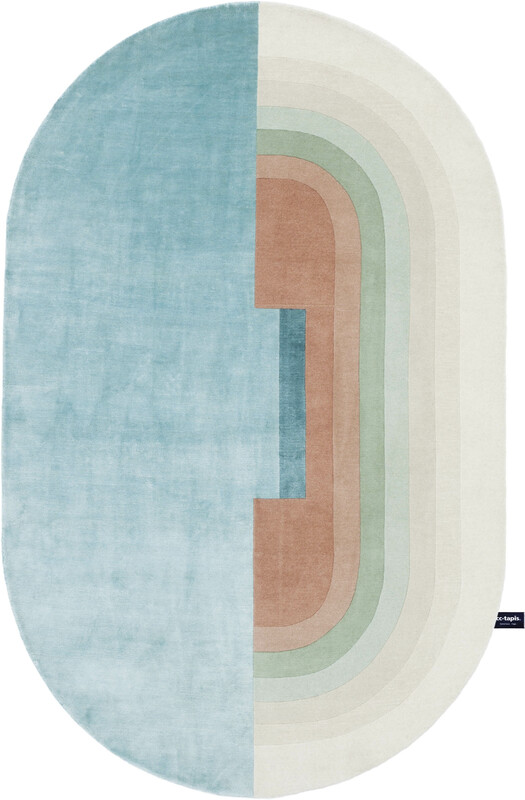 ‘Cartesio Outline’ by Elena Salmistraro for cc-tapis. | Image courtesy of cc-tapis. During the 2018 C.E. edition of the Salone del Mobile, cc-tapis won the prestigious ‘Salone del Mobile Milano Award’ for their stand at the exhibition2. The prize is decided by a jury of internationally renowned figures from the world of design including: Chiara Alessi, Stefano Boeri, Giovanni Gastel, Angela Rui, and Deyan Sudjic. Considering the prize is awarded across all exhibitor categories, which includes exceptionally large a global brands who spend significant sums on their presentation, this is not only quite the exceptional accolade but it also came as a surprise to Cantoni and Lora. Daniele Lora (DL): Pure surprise. FC: These large firms, they have big and beautiful displays. And us, we have an eighty (80) square meter stand. Of course we try to translate the design language of our home office into the stand for continuity of style but compared to some of the large stands…. DL: We try to keep the same materials, but more focused. FC: Yes, the Mayor, and the City Council. You know how it is during a fair. So many events and people all wanting your time. There is just so much to do, and so many parties. But at that point we realized ‘This is a big deal!’ and so we go. FC: We did and it is a great honour. MC: You said the stand incorporates a ‘continuity of style’ from your offices, and while I do see some arches and barrel vaults I don’t see the repetitive series of arches. FC: Well the arch.. It’s quintessentially Italian is it not? FC: Absolutely! What I meant to say is the stand incorporates the cc-styleTM. It’s in everything we do. The actual inspiration of the stand is the Palazzo Della Civiltà Italiana, the Palace of Italian Civilization. DL: It is also called the ‘Square Colosseum’, the Colosseo Quadrato, of Rome. Located in Rome, Italy, the Palazzo Della Civiltà Italiana was designed by the architects Giovanni Guerrini, Ernesto Bruno Lapadula and Mario Romano as the centrepiece of the Esposizione Universale Roma, the 1942 C.E. World’s Fair5. While the building was inaugurated on 30 November 1940 C.E. it was not yet finished, and later remained empty and abandoned after the exposition was canceled on 3 June 1941 C.E. due to World War II. It first opened its doors in 1953 C.E. and after an extensive renovation between 2003 C.E. and 2008 C.E. the Palazzo reöpened to the public and has since 2015 C.E. housed the offices of Italian fashion brand Fendi6. It is considered a preëminent example of Italian Fascist architecture. ‘Asmara’ by Federico Pepe for cc-tapis, shown in detail, as seen during IMM Cologne. The design is named after the capital of Eritrea, much of which was built in the colonial Italian era just prior to World War II. It is considered a premier example of a modernist Art Deco city. | Image by The Ruggist. MC: You know, I’ve not seen your stand in person since we first met in New York at the New York International Carpet Show. FC: Oh you must! If I can say this without sounding arrogant, we look much better now. MC: So that was the plan? Start making rugs, gain international renown, and show off your aesthetic to the world? FC: There is no plan. MC: Surely there must have been one when cc-tapis started? FC: Well yes and no. My wife Nelcya and I were working in hotels and perhaps I fancied myself a successful hotelier, but hotel life is not conducive to family life; unless of course you own a small or medium sized hotel and live there as well. But if you are working for someone else… . MC: I understand that feeling. FC: Precisely! Nelcya and I were exploring various business ideas, ways we could venture out onto our own. Our first working plan was to move to New York and open a Franco-Italian Deli but my father-in-law convinced us to stay in Europe and give rugs a try. MC: He’s a rug dealer? FC: Yes of course! How else would someone enter the rug business than to be convinced? ‘Cross (Me) Knot C’ by ctrlzak for cc-tapis. | Image courtesy of cc-tapis. ‘Cross (Me) Knot B’ by ctrlzak for cc-tapis. | Image courtesy of cc-tapis. FC: But I hated selling rugs from stock and wanted to do custom. So in order to do this I went back to school to study interior design. MC: That’s impressive. Most people think they already know enough and would just jump in. Now, not to sound indelicate, but you went back to school at your age? FC: Yes! Can you imagine someone my age in with all these young students? Even one of my teachers was younger than me. But that is how I met Daniele and how cc-tapis started. MC: You were in school together? And how old were each of you? DL: Hmm. Twenty-three (23) or twenty-four (24). I had been working for a Milanese architecture firm, Parisotto+Formenton, but returned to school to complete my Masters degree. I intended to return to the firm but wanted to try rugs [when Cantoni offered]. MC: So you two meet at design school and cc-tapis was born. MC: You just did. Do you mean similar taste? The Parvata Rug. 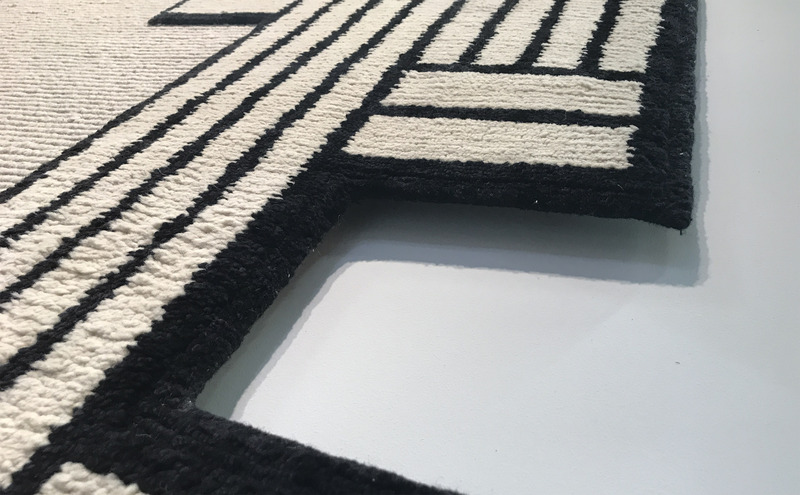 Débuted during the 2019 Maison et Objet, the Parvata rug was designed by Jean-Marie Massaud for both cc-foreducation and cc-tapis. As a series of only six (6) pieces handknotted in silk with linen borders, each individually numbered carpet will be sold with all proceeds going to the non-profit organization cc-foreducation in order to provide a complete education for students in Nepal. From cc-tapis: ‘An homage to the country it was created in, the name Parvata is the Nepali word for mountain and is produced by cc-tapis in the Kathmandu valley at the base of the Himalayas. 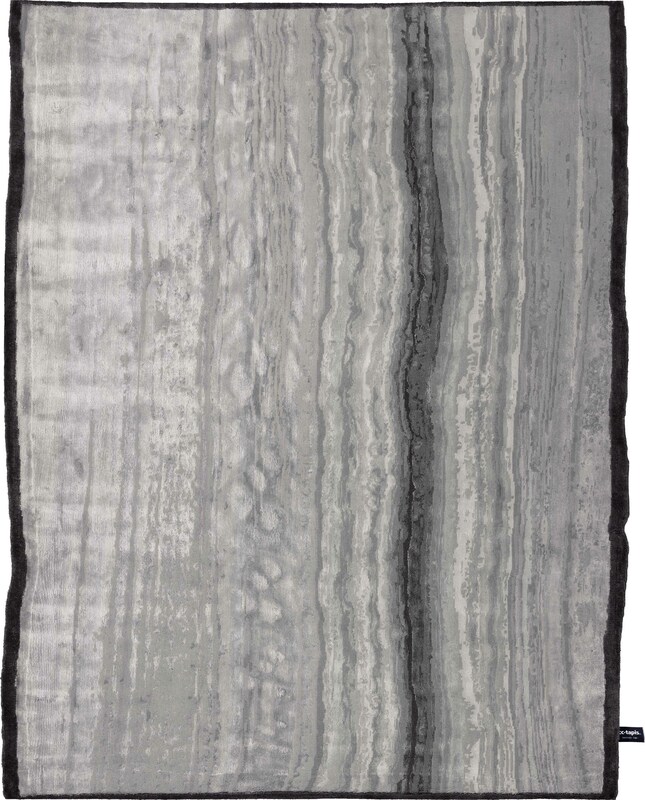 A rug born to enrich the lives of the craftsmen that created it.’ | Image courtesy of cc-tapis. FC: Probably, but from our perspective it is good taste and so as you say, cc-tapis was born in 2011 C.E. DL: We started in a basement space in 2010 C.E. one (1) year before we opened and expanded. FC: If there was a plan as you ask, it was to create beautiful and stylish rugs and to conduct ourselves, our business, in an ethical manner. You know Michael, there has been a lot of damage done to the [reputation of the] profession of rug merchant over the past decade. I like to think we are working to improve that. DL: We notice in the rug industry a distinct lack of brand identity. Even the biggest companies are focused on the product creating a lot of beautiful rugs, but there is no brand. FC: The carpets don’t connect with the presentation. DL: The product and the quality do not connect. DL: It’s the naïveté of the fast sales approach. FC: Yes! It’s the vision d’ensemble. Hopefully we are doing something right. Daniele Lora, Artistic Director, cc-tapis; shown in the stand of the firm during the 2019 IMM Cologne. | Image by The Ruggist. In year 2017 C.E. cc-tapis and their Kathmandu, Nepal based manufactory were in the top ten (10) exporters of carpets from the country.8 For a firm to emerge from the primordial carpet dust and climb to the top in only six or seven (6 or 7) years is no small achievement, speaking volumns to the affinity consumers have for this manner of carpet and its presentation and sales methodology. FC: We are a bit old fashioned when it comes to the quality and construction of our carpets but we bring in others without a background in rugs to expand our repertoire. Daniele, as our Artistic Director brings a cohesive aesthetic to the firm. DL: It can be complicated technical work. First thing is to combine the vision of the finished carpet with the construction techniques. It is much more than just the white canvas idea. 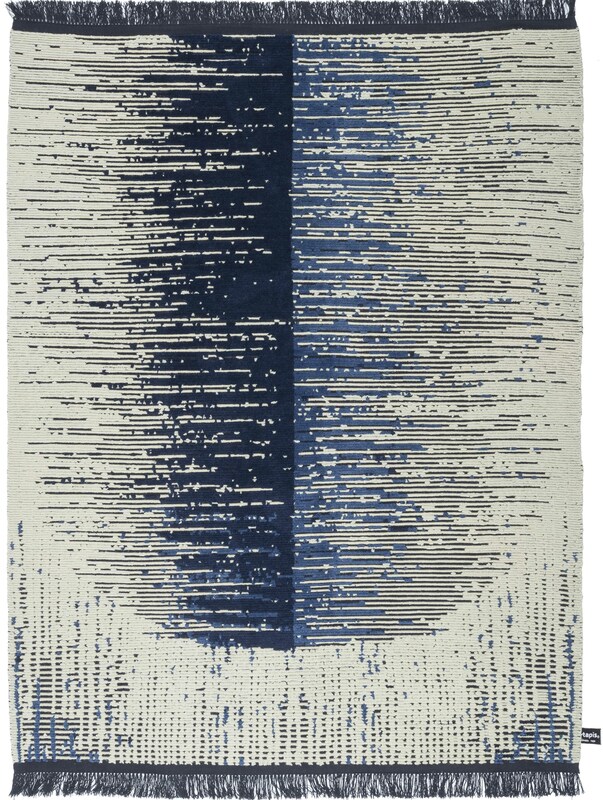 ‘Giudecca’ by Zanellato Bortotto from the Signature Collection of cc-tapis. | Image courtesy of cc-tapis. 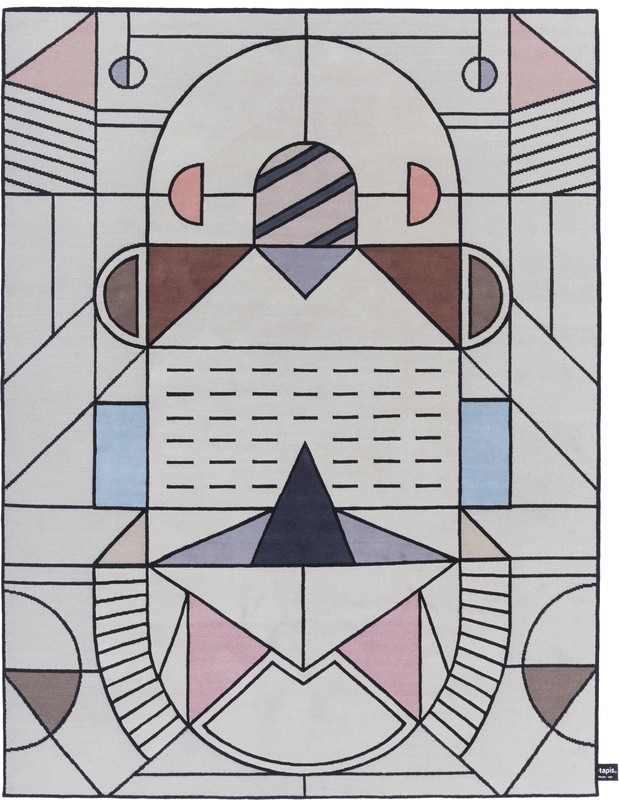 ‘New Japan’ by Chiara Andreatti for cc-tapis. | Image courtesy of cc-tapis. ‘The white canvas idea is the idea that a rug is just one of another thousand white slates upon which it is possible to draw something. ‘Splashing a nice design on it.’ I think I said during the interview, like an artisanal way of printing. This just happens to be the approach that works well for cc-tapis. Lora’s comments also remind of something Cantoni noted earlier in our conversation. 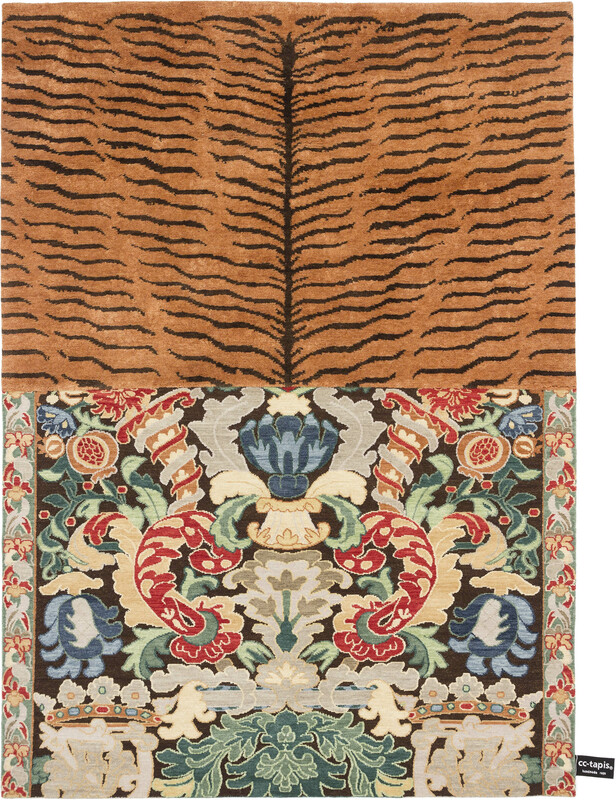 ‘The first rugs we created were horrible. But they sold!’ While I will concede Cantoni’s own self-reflective critique, it is hard to imagine any of the rugs the firm has created as truly horrible. 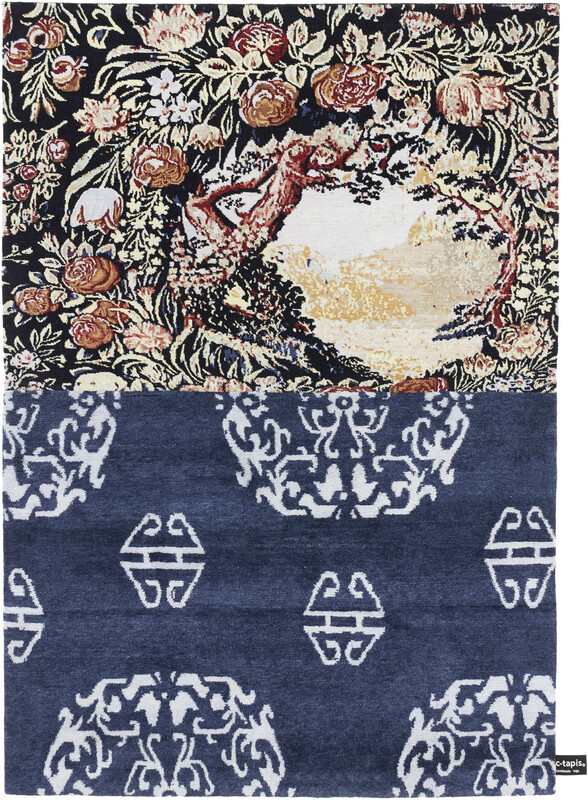 However, it is notable that as a brand conscious firm, mistakes, or perhaps to say more delicately, under performing rugs, aren’t dwelled upon and new projects, new collaborations arise to keep the firm at the top of their game. MC: So what’s next on the horizon for cc-tapis? FC: As long as we have projects, we are happy. DL: In September we have a photoshoot for our new 2019 campaign. It is something new and very different. We are shooting it at the Villa Panza outside Varese. Villa Panza is a historic villa built in the hills outside of Varese in Northern Italy. Built in the 17th century in a ‘barochetto’ architectural style, the villa features beautiful traditional decorative elements internally as well as externally and houses the ‘Villa Panza Collection’ of 20th century modern art including works by artists such as Dan Flavin, Robert Wilson, and James Turrell9. FC: Plus then it will be fair season. We go first to London and then Beirut to support our dealers, and then onward to fairs such as IMM Cologne and Maison et Objet. You should come and see our stand. It has improved a lot since we first met as you say in New York. MC: I may just do that, but now I think you would like to leave the city and I would like to explore Milan a bit. FC: Oh right. This is your first time in Milano. You’re going to see the Duomo of course? FC: You must do the terraces of the Duomo. The view is of course not like the inside, but… well you simply must see it. MC: I will. Any other advice? FC: Yes! It was designed by the film director Wes Anderson. Do you know his work? 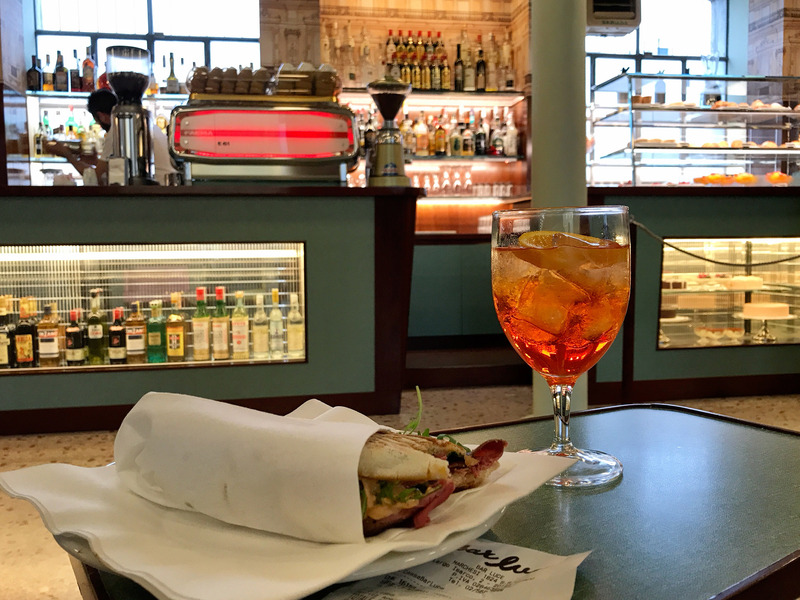 A roast beef panino and an Aperol Spritz were on the late lunch menu for The Ruggist at Bar Luce. | Image by The Ruggist. MC: You sir have no idea how much I love Wes Anderson. I think you accidentally just made my day. That will be my plan, the Duomo and Bar Luce. So until the next time. Cheers! Notable throughout my exchange with Cantoni and Lora was a focus on what cc-tapis is, that is to say in Lora’s words, cc-tapis is an ‘aesthetic reflection of an idea.’ What that idea is precisely is open to conjecture. cc-tapis is of course a rug company but they learned early in their existence that the old, antiquated distribution model of rugs and carpets was not for them. 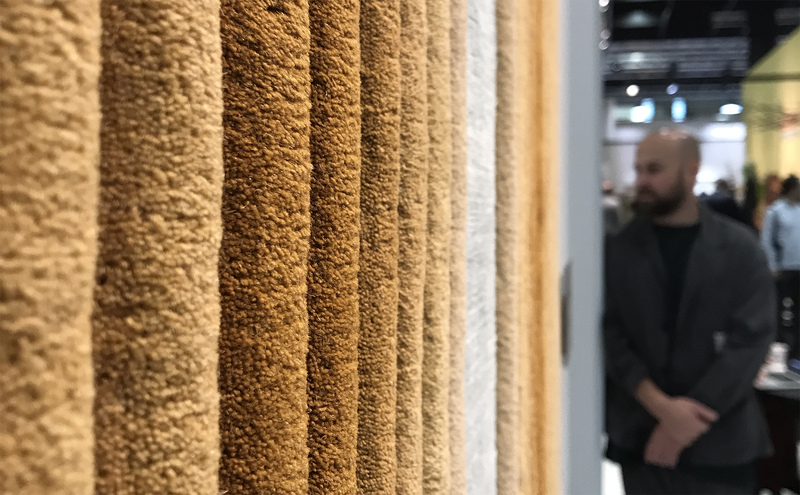 Having exhibited at traditional rug only, business to business fairs such as Domotex and the now defunct New York International Carpet Show, they found the pricing model to be outmoded and not reflective of the consumer habits of this era. ‘How serious about design can you be if you begin a conversation with ‘How much?” Cantoni asked me rhetorically. cc-tapis, like other very successful carpetry firms of this time have transcended the notion that rugs must be sold via the maker to exporter to importer/designer to distributor to retailer to consumer model wherein the rug designer is but a bit player, in its stead choosing to focus more on the brand, the ‘aesthetic reflection of an idea’ that has a certain allure for customers seeking more than just another rug. Also worthy of note, and I have said this to several colleagues including Cantoni himself when I saw him walking the halls of Domotex in 2019 C.E., is that not once during my entire conversation with him and Lora did either of them mention cost, or price, of any of their work – rugs, marketing, or otherwise. This is not to say budget is not a consideration; it is as Cantoni would remark to me during IMM Cologne in 2019 C.E. only after I mentioned this topic to him. Rather it is to accept that if one is presenting high-quality, well crafted rugs and carpets – if we are being frank ones typically consumed by those of means – and adhering to the concept of the ‘vision d’ensemble’, it follows that everything one does, be it marketing materials, offices, presentation, even personal style, must be of the same caliber. So of course money was spent to make the catalog, and of course the stand had a significant cost associated with it, but for the consumer who will buy a cc-tapis carpet, they need not be told this; they already know. And that omission, willful, unintentional, or otherwise stood proud as perhaps the most apparent example of cc-tapis’ understanding of not only design, but the current market as well. Christie MAC. Interview Notes from Notebook, Volumn Three (3). Wilshire MG. Third Edition of the Salone Del Mobile.Milano Award. Salone del Mobile; 2018:1-3. Continent – Wikipedia. Continent – Wikipedia. https://en.wikipedia.org/wiki/Continent. Accessed February 7, 2019. April 09-14, 2019 – Salone del Mobile Milano. salonemilano. https://www.salonemilano.it/en/. Accessed February 7, 2019. Palazzo della Civiltà Italiana – Wikipedia. Palazzo della Civiltà Italiana. https://en.wikipedia.org/wiki/Palazzo_della_Civiltà_Italiana. Accessed February 7, 2019. Fendi. Palazzo della Civiltà Italiana. https://www.fendi.com/us/fendi-roma/fendi-is-rome/palazzo-della-civilta-italiana. Accessed February 7, 2019.
cc-tapis | Brera Design Apartment. cc-tapis. https://www.breradesignapartment.com/brand/cc-tapis/. Accessed February 11, 2019. Thapa BB. Woolen Carpet as a Dynamic Export Product. Nepal Carpet. 2018;(22):66-70.
cc-tapis at Villa Panza | cc-tapis. cc-tapis. http://www.cc-tapis.com/cc-tapis-at-villa-panza/. Published January 9, 2019. Accessed February 10, 2019. Genchi Genbutsu – Wikipedia. Genchi Genbutsu. https://en.wikipedia.org/wiki/Genchi_Genbutsu. Accessed February 11, 2019.